An elevated B12 Boosting Seaweed Pesto like you have never tried before! Enriched with B vitamins (Nori contains a lot of B12, hello vegans! 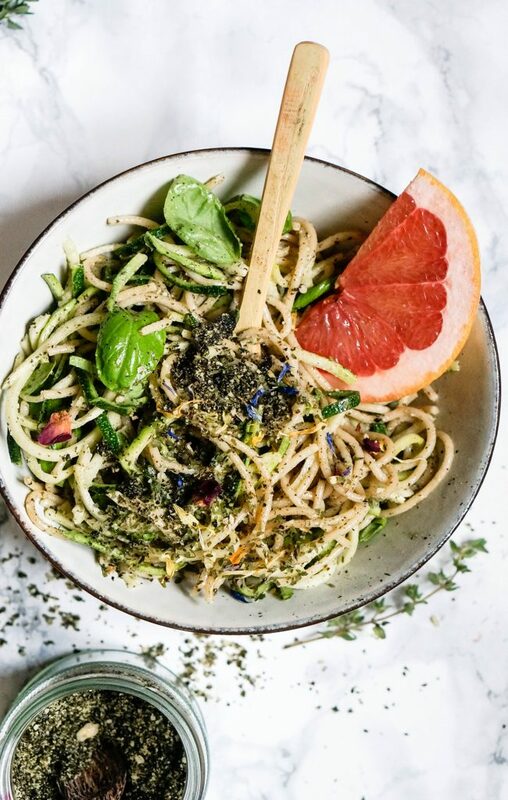 ), iodine (essential for your thyroid), and minerals including zinc, manganese, iron, selenium – this Seaweed Pesto should be part of every vegan’s pantry! So this is not just your usual basil pesto. But yes, we do add basil too just because it tastes amazing with pasta! And talking about pasta, your Seaweed Pesto tastes fantastic with any pasta dish but it also adds a flavor punch to salad sauces, veggies or your buddha bowl. Plus, if you have a good blender the pesto comes together in no time. I am also adding nutritional yeast here, not only because of its cheesy flavor but also it conatins B12 and B6 vitamins so wipe your B12 deficiency worries away and enjoy a big bowl of pasta instead! Add all ingredients to your blender and blend until you get a fine pesto powder. Fill in a clean jar and store in a dry place. When added to your pasta add a spritzer of lemon juice and olive before sprinkling on the pasta. It just adds that amazing freshness you don’t want to miss out on.